In your first personalized kicking session with Kicking World, we break down your technique from steps, to approach, to contact, and follow through. 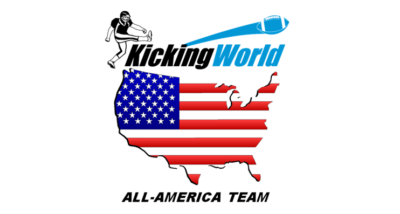 At Kicking World.com we feel that if you want to be the best, you need to put in the effort year round, not just 3 months out of the year. This means you need to keep your body in optimal condition by weight-training, running, swimming, etc. The time you put in off the field is crucial to your success come game time. With this being said, the most vital component to your success as a kicker is receiving personalized kicking instruction weekly. In your first personalized kicking session with Kicking World, we break down your technique from steps, to approach, to contact, and follow through. Every aspect of your kicks is analyzed and critiqued. After a thorough observation of your kicking performance, we will go over with you what good and what bad techniques you posses. From here, we are able to work on your personalized kicking plan, and set target goals as to where you should be able to get to in the coming weeks. Our goal is to help you become a smarter, stronger, more consistent kicker.